Putting Idaho® French fries on your menu is one of the easiest ways to increase sales and improve profits. They're quick to prepare and have a high value perception and low food cost. Your customers love French fries, and with Idaho® Potatoes, you're giving them the best, most-consistent, fresh-cut fries available. For the best hand-cut Idaho® French fry yield, we recommend using U.S. grade No. 1 fresh Idaho® Potatoes, 7-15 oz. packed 90 to 70 count in 50 lb. cartons or 12 oz. and larger No. 2 potatoes packed in paper bags. Fresh, unpeeled potatoes for frying should be stored in a dark, cool area, preferably at 55°F. Do not refrigerate, as temperatures below 42°F cause potato starch to turn to sugar. Check the cutting blades, replace if jagged. Keep the skin on to enhance homemade appearance and flavor. Fries made from peeled potatoes should be chilled after cutting in cold water for 30 minutes to 2 hours before frying to ensure maximum crispiness., Add citrus acid or vinegar to the water solution to prevent darkening. Spin-dry before frying to avoid spattering and reduce fat absorption. Fresh fries are best blanched. Get a crispier finished fry by blanching potatoes in hot oil to precook before peak periods and then finish in a final fry before serving. Fries are completely cooked during the blanching stage at a lower temperature to allow the potato to cook slowly without becoming golden brown. After blanching, allow fries to cool to room temperature or, preferably, refrigerate in uncovered containers before the final fry to a golden brown. Hold at 300°F in a warming cabinet or at 100°-120°F under a heat lamp never for more than 10 minutes. Underfrying, salting too soon, and leaving a basket over the fryer too long will result in poor texture and limp fries. To prevent excessive oil usage, drain baskets by shaking lightly or increase frying temperature. A study by Johnson & Wales University College of Culinary Arts showed the best potatoes for fresh French fries are the Idaho® Russet Burbank variety. When frying the Norkotah variety, allow for more cook time by reducing the temperatures for blanching or finish frying. Fresh Idaho® Mashed Potatoes are one of the most popular items in foodservice because their versatility allows chefs to use them as an economical side dish or as a base ingredient for signature dishes, with exciting variations that include buttermilk-bacon and garlic-olive oil. Add herbs to accent natural flavor. Leave the skins on for increased vitamins and minerals. Add to a leek and onion soup base. Add buttermilk and paprika for lively flavor. Cook with chicken stock and skim milk, adding ground nutmeg or ground coriander to taste. For best results, use any size U.S. grade No. 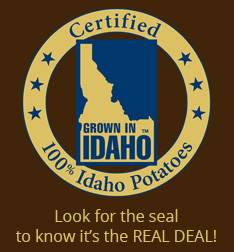 1 fresh Idaho® potatoes packed in cartons or the less-expensive grade No. 2 packed in bags or burlap sacks. Keep fresh potatoes in a dark, cool area, preferably at 45°F. Do not refrigerate. Cook with their skins, then rinse and peel. Cook potatoes until fork tender. * Heat milk until scalding. Drain potatoes; peel if necessary. Place in mixer. Pour heated milk into mixer with potatoes. Whip on low setting until smooth, about 1-2 minutes. Add butter or margarine and salt. Whip on high setting for 3-4 minutes. Sauté minced shallots, minced garlic, chopped mushrooms, and chopped black olives in butter. Form mashed potatoes into 3-inch pancakes. Top half of the pancakes with 1 tablespoon vegetable mixture. Top with remaining pancakes. Sauté in butter. Beat 3 egg yolks and add to 1 pint mashed potatoes. Add butter and cream until mixture is of piping consistency. Using a star tube, pipe potatoes onto baking sheets. Sprinkle grated Swiss cheese on top. Bake at 300°F until brown. Make a tricolored, red/green/white mashed potato presentation: Add tomato paste, basil, and olive oil to one portion of mashed potatoes, add puréed spinach and Parmesan cheese to another portion, and leave the third unflavored. For fluffier potatoes, use a ricer or hand-mash. For a dry texture, bake the potatoes instead of steaming. Heat dry spices first before adding to the potato mixture for more flavor. There's no side dish more classic than a hot, steaming baked potato. And no potato bakes better than an Idaho® Potato. The Idaho® Potato is grown and stored to produce a tuber with a high solids content. During baking, the starch grains swell and separate. A potato with small grains, such as a round red or white, will stay firm and waxy. But an Idaho® Russet Burbank or Norkotah variety with its large grains and high starch content will cook to a characteristically light, fluffy texture. In addition, Idaho® potatoes undergo less shrinkage than other potatoes giving improved yield and plate coverage. Menuing Idaho® Potatoes always shows you care about quality products. You can increase check averages by offering potato bars or baked Idaho® potatoes topped with extras., Write or call for our Genuine Idaho® Potato Bar Merchandising Guide. To make twice-baked Idaho® Potatoes, scoop out potato pulp after baking and mix with your favorite mashed potato ingredients or mix with ham and cheese, chicken fajita, or Thai beef for a main dish. We recommend 100 to 70 count Idaho® Potatoes for baking. As with all Idaho® Potatoes, store in a dry, cool place, preferably at 45°F. Never refrigerate. Excessive light will turn the skins greenish and cause a bitter flavor while heat above 60°F will cause skin shrinkage. Always wash potatoes thoroughly, being careful not to break the skin. Pierce skin with a fork to prevent bursting in the oven. To prevent excessive shrinkage during holding, coat the skin lightly with vegetable oil though this will prevent the skin from becoming crispy. Follow these guidelines for oven baking. Idaho® Potatoes can also be baked in the microwave. First wash—but do not dry—the potato. Pierce each potato and wrap in a paper towel. When baking several potatoes at once, place them end to end in a circle, about one inch apart. The potatoes may need to be turned over midway through cooking, depending on your microwave. Allow the microwaved potatoes to remain wrapped in the paper for about two minutes before serving. An ideal Idaho® Baked Potato goes directly to the customer within 15 minutes of the time it is baked to ensure crispy skin and a dry, fluffy interior. NEVER BAKE POTATOES IN FOIL. Foil wraps will not decrease baking time, but will result in a soggy potato interior with wet skin. Wrapping a baked potato in foil after it has been baked will allow you holding up to 45 minutes, and the best method for holding a baked potato is in a warming drawer. Second best is using a heat-proof cabinet where foil-wrapped potatoes can be held for 45 minutes, but with an interior temperature loss of about 20°F. Use a fork to pierce the skin in the form of a cross before serving. Do not cut with a knife as this flattens the surface and prevents the potato from being fluffy. Open the potato just before serving by pressing the ends toward the center and lifting and fluffing the meat of the potato with a fork. Whether you call them hash browns, home fries, fried potatoes, or skillet fries, the best are made with Idaho® Potatoes. The Idaho® Russet Burbank or Norkotah varieties are ideal for hash browns with their satisfying taste and texture. The high solids content provides a distinct texture and hearty flavor. They also absorb less fat in cooking. Idaho® Hash Browns also undergo less shrinkage for improved yield and plate coverage due to their low moisture content. Their low sugar content ensures that they will cook to a golden-brown color. Serve Idaho® Hash Browns with every breakfast entrée to increase value or as an á la carte side to increase check averages. At lunch, use hash browns to add delicious flavors to quiche crusts, soups, and breads. At dinner, serve garlic potato cakes as an appetizer or as a side with meat entrées. For Southwest flavor, toss hash browns with corn, diced red pepper, minced jalapeño peppers, and garlic. Top with guacamole or salsa and serve with steak, ribs, or pork. Add chopped red pepper, minced garlic, chopped fresh sage leaves, and ground black pepper. Make a hash brown pizza by topping cooked hash browns with sliced roasted vegetables and a blend of cheeses, then bake. Add grated, sliced zucchini and grated parsnips or turnips; season with garlic, sage, and rosemary and skillet-cook. Top with goat cheese and bake. Serve with sautéed, diced apple. Add chopped onions, diced red and green peppers, and red pepper flakes. Add garlic and fresh herbs and top with a tomato-basil sauce. Use a nonstick fry pan and cooking spray instead of oil for reduced-fat hash browns. Oven-bake to substantially reduce fat and calories. Spray pan with nonstick butter-flavored cooking spray before baking. For best results, use U.S. grade No. 1 fresh Idaho® Potatoes, 120 to 140 count, packed in 50 lb. cartons. Grade No. 2 Idaho® Potatoes, economically packed in bags, are also ideal for hash browns. You will need approximately 6 pounds of potatoes for 25 ½-cup servings. We recommend using unpeeled potatoes for hash browns, which will increase yield by 12% or more and the skins will enhance the natural, homemade flavor and appearance. Immediately soak grated potatoes in water to prevent discoloration, or par-cook potatoes before grating or use leftover baked potatoes. Avoid grating too finely or cutting too small to preserve taste and texture. Hash browns should be grilled at 375°F for 2-4 minutes. Twenty-five servings can be accommodated easily on a 31" x 32" grill. Add any optional ingredients or seasonings before grilling, then mix gently on the grill to coat all pieces. Keep the hash brown mixture loose; do not flatten. Scalloped and au gratin potatoes are the original signature potato dishes that will remind your customers of special occasions--especially if you make them with fresh Idaho® Potatoes. They are ideal for banquets because they hold well and portion easily and attractively. Idaho® Potatoes' distinct, hearty potato taste stands up well to additional seasonings and flavors. The high solids and low moisture content means you'll get less shrinkage and more plate coverage as well as a light texture. Add sliced sweet potatoes, ground nutmeg, chopped chives, and grated Parmesan cheese. Layer with turnip slices and Spanish onion slices. Add milk to cover. Dot with butter, then bake at 350°F for 45 minutes or until tender. Add Dijon-style mustard to white sauce. Layer potatoes with shredded Swiss, mozzarella, Monterey Jack, or cheddar and diced ham. Top with sauce and bake. For healthier, flavorful scalloped potatoes, use skim milk, then add chopped fresh sage leaves and thinly sliced yellow onion. Scalloped and au gratin potatoes are baked "en casserole" and made from peeled potatoes combined with flavored heavy cream, white or cheese sauce, or uncooked custard, then slowly baked until potatoes are extremely tender. For best results, use 100 - 70 count fresh Idaho® Potatoes. Slice Idaho® Potatoes 1/8-1/16" inch thick. If you preslice the potatoes, acidulate them in water with lemon juice; then dry, cover, and refrigerate to prevent browning. Layer potatoes in a buttered hotel pan and add heated cream, sauce, or custard. Shake pans to distribute ingredients evenly. Cover loosely with foil, then bake in a moderate oven (325-350°F) until tender, about one hour. Remove foil and brown as desired. For au gratin potatoes, top with bread crumbs, butter, and grated cheese after baking, then brown. The potatoes should be tender but hold their shape when portioned, and the sauce should be smooth and uncurdled. (Bake potatoes in a water bath to prevent curdling.) For most attractive portioning, hold potatoes for 10 minutes before serving. En casserole dishes hold longer than boiled or baked potatoes. Cover dish loosely with foil and hold in a warm place through a typical service period, about two hours. If necessary, reheat in the oven or brown lightly under a salamander or broiler. For quick scalloped potatoes, mix flour, salt, pepper, and milk, then pour over potatoes and bake for one hour. The long baking time dissipates the flour taste. For a low-fat version, mix skim milk, potatoes, garlic, salt, and pepper and simmer until potatoes are nearly cooked. Dilute arrowroot with a little cold milk (1/2 oz. arrowroot to 2 quarts of milk) and add to simmering potato mixture. Stir until thickened and pour into a hotel pan sprayed with cooking spray. Sprinkle bread crumbs and Parmesan cheese on top. Bake at 350°F until brown. Putting Idaho® French Fries on your menu is one of the easiest ways to increase sales and improve profits. They're quick to prepare and have a low food cost. In fact, 70% of foodservice menus include French fries-more than any other food! Your customers love French fries-and with Idaho® Potatoes, you're giving them the best fries available. The high solids content of Idaho® Potatoes ensures a distinct, mealy texture and hearty flavor. They also absorb less oil, producing crispier fries. Premium length and low moisture content mean less shrinkage for improved yield and plate coverage. And the low sugar content of Idaho® Potatoes results in light golden fries, not dark fries as with high-sugar potatoes. Specialty fries are available in distinctive, eye-catching shapes and in a variety of popular flavors and batters. Clear-coated and thicker-cut fries are also available for longer heat retention. Plain or batter-dipped, straight or curly, triangles, or tots-there are Idaho® Fries to meet your needs. Idaho® French Fries can be held for 5–7 minutes under a heat lamp (recommended for best results), on a steam table, or in warming cabinets. Unadorned French fries are always popular, but increase your fry sales and your bottom line by serving Idaho® French Fries with a variety of dips or toppings. Try salsa, blue cheese or ranch-style dip, pesto mayonnaise, or a honey-mustard dip and turn an ordinary side into an exciting side or appetizer. Most toppings can be made "healthy" by using low- or nonfat dairy products or oils. Idaho processors supply frozen French fry products in a variety of shapes, coatings, and styles. Premium French fries have the "Grown in Idaho" seal on each carton. Keep potatoes completely frozen before frying to minimize fat absorption and maximize crispness. We recommend a heat-resistant freezer close to the fryer. Rotate frozen potatoes or they will lose moisture, develop ice crystals, and absorb off-flavors. Handle frozen fries carefully to protect their length, appearance, and yield. Don't throw or drop bags or cases-a 3-foot drop can break 35% of the pieces. Be sure to find the right temperature for your frying conditions. Don't exceed 365°F. Lower the oil temperature results in longer cooking times and greater fat absorption. Use a timer for best results. Fill fry baskets half-full; overloading lowers the temperature and results in soggy, greasy fries. When fries are golden brown, lift basket and shake gently to remove excess oil. Never leave a basket over the fryer, as heat will make fries limp. Don't salt fries over the oil. A sheet pan is recommended for better air circulation. Spread potatoes in a single layer, permitting sufficient air flow and avoiding excessive moisture transfer to accelerate heat penetration. Idaho® Mashed Potatoes are one of the most popular items in foodservice-appearing on 66% menus-because their versatility allows chefs to use them as a base ingredient for signature dishes with exciting variations that include buttermilk-bacon and garlic-olive oil. The high solids content of Idaho® Potatoes provides a dry, mealy interior ideal for mashed potatoes with a distinct texture and rich, hearty flavor. The low moisture content results in lighter, fluffier mashed potatoes, prevents waxy or watery product, and improves yield. Many operators find that processed Idaho® Mashed Potatoes in flakes, granules, or frozen form offer significant cost and labor savings. Preseasoned, butter-flavored mashed potatoes with made-from-scratch flavor and appearance are also available. Blend with spices, chopped niçoise olives, olive oil, and milk. Add sautéed onion, chopped basil, minced garlic, and grated Parmigiano-Reggiano. Add 3 egg yolks per 1 pint mashed potatoes. Add butter and cream until mixture is of piping consistency. Using a star tube, pipe potatoes onto baking sheets. Sprinkle grated Swiss cheese on top. Bake at 300°F until brown. Idaho® Instant Mashed Potato Flakes can be used in a number of versatile recipes in their dry form. Add flakes to breading for fish, chicken, and vegetables or use them with a combination of flour, corn meal, or crushed corn flakes. Thicken soups and stews and increase moistness by adding flakes to bread, pancakes, doughnuts, and roll recipes. Simply add 3/4 cup flakes to every 5 to 6 cups of flour. Using herbs instead of salt to accent the natural flavor of mashed potatoes. Adding mashed potatoes to a leek and onion soup base. Add buttermilk and paprika for lively flavor. Preparing mashed potatoes with chicken stock and skim milk; add ground nutmeg or ground coriander. When making Idaho® Mashed Potatoes from flakes or granules, always read and follow the manufacturer's directions carefully. Store unopened containers away from intense heat. After opening, cover each container with a tight-fitting lid and store in a cool, dry area. When adding milk (whole, low-fat, skim, or nonfat dry) to flakes or granules, it must be at refrigerator temperature (35 - 40°F). Processed Idaho® Mashed Potatoes can be held in a steam table (moist heat #5). Granules should be held no more than 30 minutes; flakes, no more than 1-1/4 hours. Granules and flakes can also be held in 250°F warming cabinets for 30 and 50 minutes, respectively. Hold potatoes in deep pans and keep covered with a lid or plastic wrap. If a dry heat table is used, set pan in water bath. Frozen Idaho® Potatoes are precooked and precut, meaning less preparation time. Follow the manufacturer's directions for steaming, boiling, or microwaving. Typically, mashed potatoes made from a frozen product can be held longer-usually up to 4 hours on a steam table or in a warming cabinet at 175 - 200°F. Refer to the manufacturer's directions for specific steaming, boiling, microwaving, and holding times. Idaho® Potato Skins are fun, delectable, and appealing as a side dish, an appetizer, a light meal, or at parties and receptions. There's no side dish more classic than a hot, steaming baked potato, and offering Idaho® Twice-Baked Potatoes is a great way to add value to your menu. Check with your supplier or distributor-Idaho® Baked, Twice-Baked Potatoes, and Idaho® Potato Skins are available frozen in a wide variety of sizes and flavors to save time and labor. Many processors are also willing to develop custom products, as well. All of the factors that make the Idaho® Potato the most preferred potato make frozen Idaho® Twice-Baked and Skins great. The low moisture content, 21% solids, and low sugar content result in less shrinkage, distinct texture, and delicious taste with a skin that is ideal for twice-baked and skin applications. Although Idaho® Twice-Baked Potatoes come in a variety of flavors that need no extras, you can make yours extra special by sprinkling with fresh herbs or grated cheese, or by drizzling with cheese sauce or gravy. Mushrooms, onions, tomatoes, broccoli, cauliflower, carrots, green peppers, sprouts. Butter/margarine; Parmesan, cottage, ricotta, blue, and cheddar cheeses. Diced ham, ground beef, shredded chicken, surimi chunks. Chili, pizza sauce, BBQ sauce, salsa, guacamole, salad dressings. Melted butter and a blend of ground white, black, and pink peppercorns. Melted butter and dried tarragon leaves, dried basil leaves, and dried rosemary leaves. Olive oil, garlic powder, dried mint leaves, and dried oregano leaves. Olive oil and dried thyme leaves, dried parsley, and minced onion. For low-fat skins, try spraying the skins with butter-flavored cooking spray, then bake. Setting up an Idaho® Potato Skin bar, similar to a potato bar, is a fun way to allow customers to create their own signature potato skins. For complete information on potato bars, write or call for our Genuine Idaho® Potato Bar Merchandising Guide. As with all processed Idaho® Potato products, always read and follow the manufacturer's directions carefully for best results. Keep in mind you save yourself 2/3 preparation time versus scratch and there's less waste with frozen. You can maintain an exact portion control of every serving and maintain consistent quality. Whether you call them hash browns, home fries, fried potatoes, or skillet fries, the best are made with Idaho® Potatoes-the essential ingredient for hash browns with a satisfying taste and texture due to their high solids content. Dehydrated or frozen hash browns are both cost and labor efficient, without sacrificing that great Idaho® Potato taste. Dehydrated Idaho® Hash Browns are packed in a variety of foodservice sizes in cartons or bags. For Southwest flavor, toss Idaho® Hash Browns with corn, diced red pepper, minced jalapeño peppers, and garlic. Top with guacamole or salsa and serve with steak, ribs, or pork. Add grated, sliced zucchini and grated parsnips or turnips. Season with garlic, sage, and rosemary, then skillet-cook. Line muffin tins with hash browns and bake off as individual cups for scrambled eggs at brunch. Reduce fat by using a nonstick fry pan and cooking spray instead of oil. Oven-bake instead of frying to substantially reduce fat and calories. Spray pan with nonstick butter-flavored cooking spray before baking. When cooking processed Idaho® Hash Browns, always read and follow the manufacturer's directions carefully. Store cases of frozen Idaho® Hash Browns in a freezer at 0°F or colder. Rotate frozen hash browns; otherwise they will lose moisture, develop ice crystals, and absorb off-flavors. Unopened containers of dehydrated hash browns can be stored in a cool, dry area for up to one year. After opening, cover each container with a tight-fitting lid and store in a cool, dry area for up to six months. Thaw frozen hash browns in refrigerator prior to grilling. Oil the preheated grill; do not pour oil over the hash browns. Avoid flattening the hash browns. Keep the mixture loose so that the surfaces brown evenly. High temperatures will allow even browning without excess oil absorption. Be sure to find the right temperature for your frying conditions. The lower the oil temperature, the longer the cooking time and the greater the fat absorption. When hash browns are golden in color, lift basket and shake gently to remove excess oil. Never leave basket over fryer; heat will make hash browns soggy. Use a sheet pan for better circulation. Thaw frozen layers in refrigerator on covered sheet pans. Mix dehydrated hash browns thoroughly to coat all pieces with melted margarine or seasonings. Layer no more than 1" of hash browns. Processed hash browns can be held in a dry heat steam table, set at 5 - 7, for 30 minutes. They can also be held in a 175°F warming cabinet for 15 - 20 minutes. Scalloped and au gratin potatoes are the original signature potato dishes that will remind your customers of special occasions-especially if you make them with Idaho® Potatoes. Idaho® Potatoes' distinct, hearty flavor stands up well to seasonings and flavors, giving you dishes with true potato taste. The high solids and low moisture content means less shrinkage, more plate coverage, and light texture. With the variety of dehydrated and frozen scalloped and au gratin potatoes available, nearly any foodservice operation can offer these premium dishes. Add ground nutmeg, chopped chives, and grated Parmesan cheese. Replace flat lasagna noodles with scalloped potatoes. Cook slices until tender, and layer hotel pan first with tomato sauce, then 1/3 of the sliced potatoes, and a spinach-ricotta mixture; repeat. Sprinkle top layer with shredded mozzarella cheese and bake for 1 hour at 400°F. As with all processed Idaho® Potato products, always read and follow the manufacturer's directions carefully for best results. The potatoes should be tender but hold their shape when portioned. The sauce should be smooth and uncurdled. For most attractive portioning, hold potatoes for 10 minutes before serving.